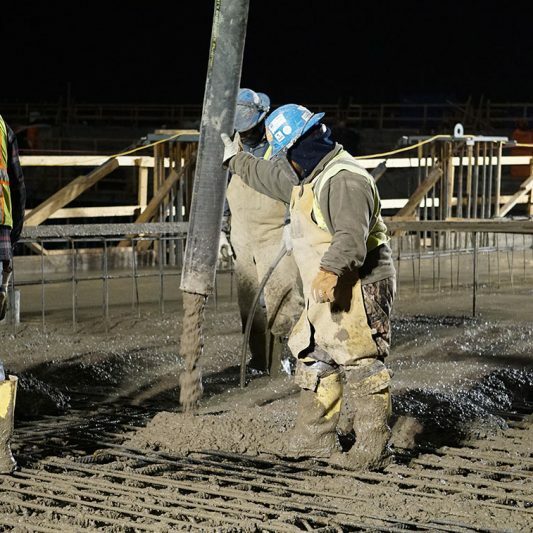 Our construction team at Dickies Arena reached another milestone on December 28, as the team completed the final concrete pour for the arena structure. A traditional concrete mix was used for the majority of the 330-yard pour, but a specialized pea gravel mix was used to fill the more tightly wound rebar that would act as the plinths – the anchor points – to the roof trusses. Crews on the roof level coordinated with the concrete company on the ground, as truck after truck moved into place to fill out the final piece of the arena. When the project broke ground on February 6, 2017, crews immediately began work on a project that will forever alter the entertainment scene in Fort Worth – Dickies Arena will become the new home for the Fort Worth Stock Show rodeo performances, and it will attract top concerts, exciting sporting events, family shows and civic events. Within the first year of construction, 1,000 concrete piers were installed to support the 14,000-seat multipurpose structure. The amount of concrete used for the piers alone was the equivalent of more than 11 miles. The remaining concrete for the adjoining support building and plaza will be poured in the next few months, resulting in a total of 85,617 cubic yards of concrete across the 17.4-acre site. To ensure the concrete is structurally sound, crews used over 9,000 tons of reinforcing steel, the equivalent of 44 Boeing 747-400s. As the concrete wraps up, work on the roof begins. The 250-foot arched steel trusses outline a roof that was designed to complement the Will Rogers Coliseum, which sits next to the Dickies Arena site. The Coliseum, which was completed in December 1936, was the first facility designed with the trusses to join at a ridge in the center, allowing the interior to be completely free from support columns. The design, which will also be seen at Dickies Arena, is found in many of today’s domed stadiums. Soon, the venue will be enclosed entirely, and work on the upscale premium seating level, variable grade seating structure and terrazzo flooring begins. When Dickies Arena opens in November 2019, it will be the premier destination in Fort Worth, offering entertainment for North Texans for years to come. Alissa Cunningham is the director of marketing for Trail Drive Management Corp., the not-for-profit operating entity of Dickies Arena. She has nine years of industry experience, having worked in arenas, stadiums and convention centers throughout the United States. Alissa graduated from Drake University with bachelor’s degrees in Journalism/Mass Communication and Law, Politics and Society.